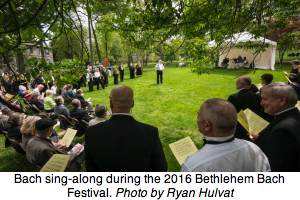 If you need to destress from the noise of the national debate, consider how the Bethlehem Bach Festival has helped communities come together to find calm, peace and prayer for more than 100 years. It was in 1900 that the two-year old Bach Choir of Bethlehem gave the first performance in North America of Bach's greatest choral work, his Mass in B Minor. With only a few exceptions, the Choir has performed the Mass every year since. 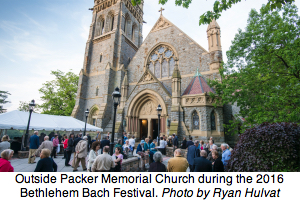 Their voices, nearly one hundred strong, cannot have been more fervent, nor more inspired by community spirit, than they were earlier this year at Packer Memorial Church, on the campus of Lehigh University, May 13 and 14. it was the first weekend of the 109th Bethlehem Bach Festival, and the house was packed. 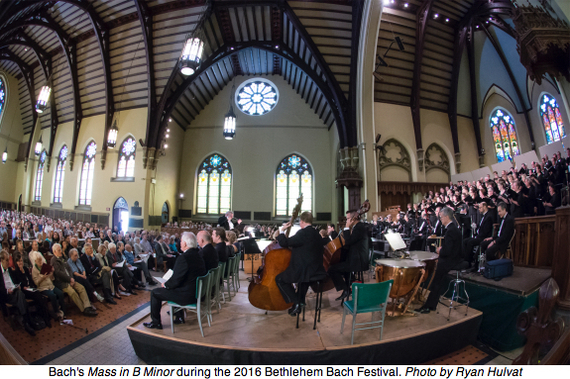 Led by by Greg Funfgeld, artistic director and conductor since 1983, the Bethlehem Bach Festival's two performances each year of its signature work, the Mass in B Minor, represent a link with the America of Andy Hardy. It was a time when classical music, and the arts in general, aspired to provide guidance and energy to communities nationwide; in the case of Bethlehem, it was according to the University's holistic motto, "Homo Minister et Interpres Naturae," which translates loosely to "Woman and Man, servants and interpreters of nature." The performance was one of integrity, movement, passion and weight. The effortless virtuosity and stylistic homogeneity of the combined forces in the chapel's stone sanctity, allowed Bach's music to sing out with infectious, exhilarating enthusiasm. Agnes Zsigovics, Rosa Lamoreaux, Daniel Taylor, Benjamin Butterfield, William Sharp and Daniel Lichti were outstanding soloists. The Choir was large, warm and flexible. With a collaborative interpretive approach based on the latest scholarly research, kept honest by the great Bach biographer Christoph Wolff in the front row, Funfgeld focused on creating a compelling flow in which the emotional weight of each section was directed upwards, as if the music were being offered to Bach's God. The rolling out of the massive, six-part fugue in the "Sanctus" was the most perfect single demonstration of how Funfgeld's combined forces combined the intimate and the infinite. And beyond the music, there was a different authenticity from listening in an audience which, as I came to know, heard -- as Bach intended in his humility -- the prayers for consolation and peace inseparably from the music itself. If you were not there, you can hear the same deep intensity of music making on the Festival's recording from 1998. 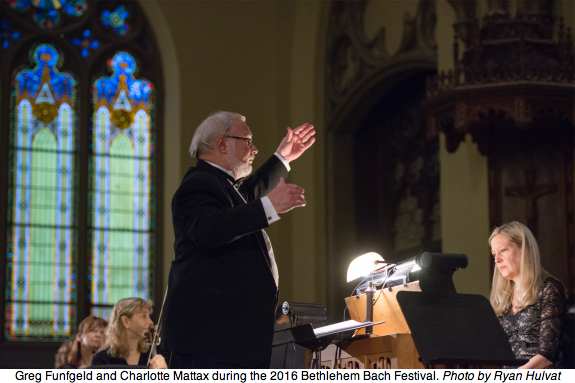 Bethlehem may no longer have Bethlehem Steel, but it has in the cultural fuel of its Bethlehem Bach Festival a generous helping of GPS for the soul. 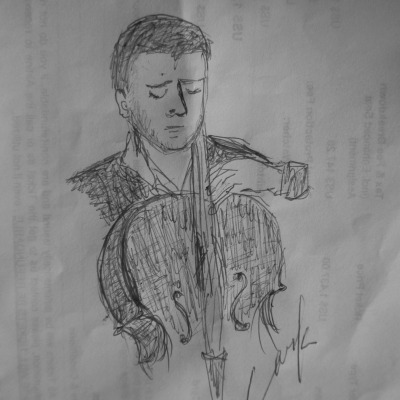 There was more to the two-day musical feast than just the B Minor Mass. On Friday afternoon, Dr. Wolff gave a stimulating lecture, and the first of two public, Bach chorale sing-alongs ensued. Friday evening, it was an exuberant, feel good concert of Bach's gloriously optimistic Cantata No. 100, the Second Brandenburg Concerto with the brilliant trumpet soloist Terry Everson, and the procession of gorgeous delights known as the Easter Oratorio. On Saturday morning, at the University's Zoellner Arts Center just down the block, the Taylor 2 unit of the Paul Taylor Dance Company, with the Festival Orchestra in the pit, charmed the audience, who charmed them back with their encouragement and eager applause, in a series of joyful, inventive responses to and illuminations of music by Handel and Bach. Then at last, after a brisk walk and a healthy lunch, the B Minor Mass of Johann Sebastian Bach, Part One, began at 2:30; Part Two began at 4:30. Then out into the night for a recreation on the Moravian College campus of the Cafe Zimmermann in Leipzig, where Bach and his fellow musicians and townspeople spent many pleasant evenings, quenching their thirsts in both music and coffee. It was thirsty work being Bach. The Bethlehem Bach Festival's endurance has enabled the Bach Choir of Bethlehem to give 31 concerts and educational programs year-round, reaching an audience of more than 20,000. The Choir will conclude its season December 10 and 11 with Christmas concerts in Bethlehem and Allentown, and probably snow on the ground and sleigh bells ringing in the air.